Too much to do….lady’s got a paper due in about 2 weeks so all of my free time is being devoted to getting through class readings and researching…so alas I am not able to get to an actual museum today. However I have an exhibition that has been waiting in the throngs to be discussed so it’s perfect. I told you all last week that I had a bunch saved up and was a few weeks behind anyway. I’m hoping that next week I can get out to the Freer and Sackler to check out their In the Realm of the Buddha exhibition. I’m sure at that point I will be ready for another break. Picasso…..at MoMA. I saw this exhibition the same time that I saw the Tim Burton, and as we had a bus to catch we sort of ran through the show. It was a much smaller show than Burton so this wasn’t all bad. Kristin had a membership so the show was only open to members that day which was nice as we had just been fighting crowds in the other exhibition so being able to walk through with just a few people was refreshing. Initially I was not over ecstatic about seeing Picasso, I enjoy his work as much as the next person, but there are only so many times that you can walk through the blue period or the rose period before you feel like you’ve seen it all. I don’t think I really understood Picasso until I had seen some of his earlier works that are so technically sound that you finally understand why he did what he did. He definately had the talent to back up the creative liberties he took in his later and more recognizable works. side note: abstract art and I have always had a difficult relationship. Some of it I like and some of it I just wonder if someone decided to paint one day and did just that, so for me I always like to see where the artists are technically through drawings or more realism art. Just to see what kind of an artist they really are. I find that this also helps me understand where a painter is coming from. This exhibition was not what I was expecting at all. 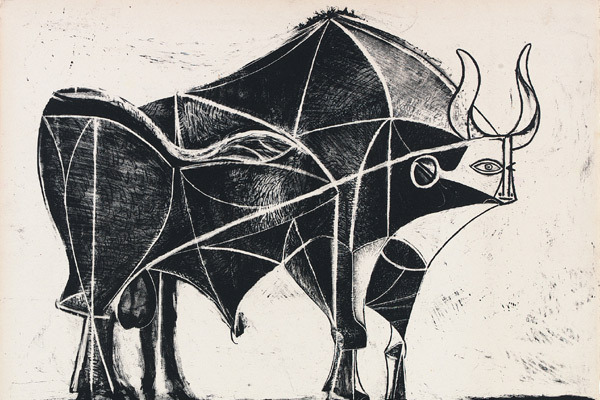 Themes and Variations takes us through Picasso’s process. Which I think is a creative and interesting way to direct a show. The way that Picasso came to his finished pieces was by creating multiple sketches and rough paintings of his subjects in basically the same position, pose, or environment. While each image is a little different than the next you can see the evolution of his works. How many times he recreated a piece before he created the final one. It’s a small exhibition that only take us 2 rooms of the MoMA. But I would definitely recommend heading to NYC if you get a chance for it.